In the years right after World War II, a man named Joyce Hornady had a crazy idea. There was plenty of surplus ammo on the market, but none of it was hunting ammo—and modern-day hunting was just taking off as returning servicemen and others began heading to the fields and forest. Hornady thought what these hunters needed was a quality hunting bullet they could reload, so he designed a .30 caliber spire point, bought some surplus machining equipment and set up shop. Hornady managed to sell $10,000 worth of these bullets in his first year. 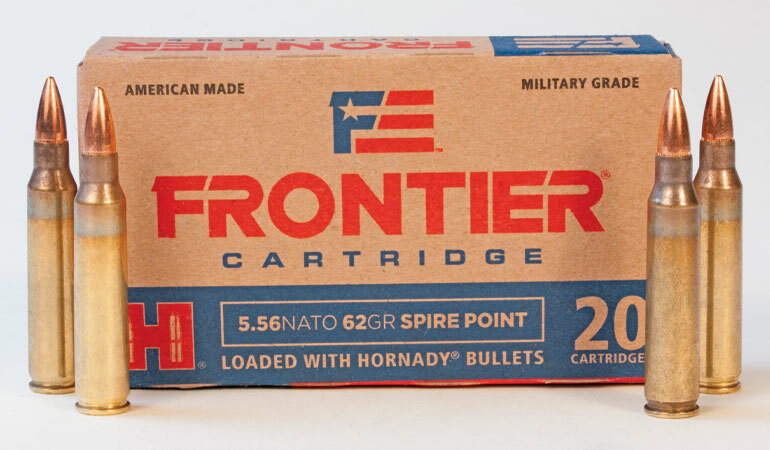 His operation and his offerings expanded over the next decade or so, and 1964 saw the formation of the Frontier Ammunition company—which today we know as Hornady Manufacturing. Now hunters didn’t have to reload to enjoy the benefits of Hornady’s “accurate, deadly and dependable” bullet, to borrow Joyce Hornady’s first marketing slogan. I remember Frontier ammo, and probably many of you do as well. Hornady is banking on that as it reintroduces a line of ammo with the same name. The ammunition is being produced at the Lake City Army Ammunition plant in Missouri—using Hornady bullets and Lake City brass, just as the original Frontier Ammunition Company did. If you’re not familiar with Lake City, it is one of several government-owned facilities that produced ammnunition for U.S. war efforts. Lake City was begun by Remington Arms, later sold to Olin Corp. (owner of Winchester ammunition), then to ATK (owner then of Federal) and is currently run by Federal and owned by Northrop Grumman. Lake City churns out more than a billion cartridges in a year, and it is this huge capacity Hornady sought in order to produce quality rounds—loaded with its own bullets—at a competitive price. “As a bullet manufacturer, one of the biggest, we have the ability with the Lake City organization to provide military spec cartridges with better bullets,” said Hornady vice president Jason Hornady. It’s essentially the company’s first foray into the “white box” world of inexpensive ammunition, and current Frontier loads are in .223 Rem. and 5.56 NATO cartridges. The breadth of the line is pretty impressive. It includes: 55-grain full metal jacket, spire point and hollowpoint match; 62-grain full metal jacket and spire point (5.56 only); a 68-grain boattail hollowpoint match; and a 75-grain boattail hollowpoint match (5.56 only). If you’re looking for quality ammunition for your .223 Rem. 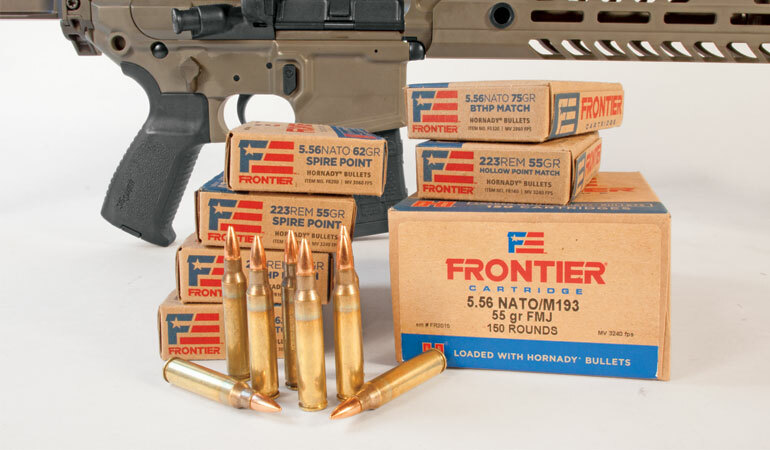 or 5.56 NATO rifle, look no further than Frontier, which features Lake City brass and Hornady bullets. I had the opportunity to test the 55-grain full metal jacket in both .223 and 5.56, and it proved decently accurate. I’d love to be able to report it delivers sub-minute groups, but alas I don’t currently own an AR capable of delivering that level of accuracy. The .223 version averaged 2,893 fps out of a 16-inch barrel, with an extreme spread of 94 fps and a standard deviation of 26 fps for 20 shots. The 5.56, fired the same number of shots out of the same barrel, generated 3,093 fps with an extreme spread of 56 fps and a standard deviation of 16 fps. So in the case of this test, the .223 demonstrated decent consistency, and I would call the 5.56 above average. I was curious about how consistent Lake City’s cases might be since they produce so many of them, so when I got home I grabbed 10 cases from each caliber I’d just fired and weighed the empties. The .223 cases averaged 96.0 grains, with a spread of 1.7 grains between the heaviest and lightest; standard deviation was 0.5 grain. The 5.56 cases averaged 96.4 grains, with a 1.2-grain high/low spread and standard deviation of 0.44 grain. Cases are only one part of the equation, of course. I also weighed 10 rounds of the same 55-grain full metal jacket in 5.56 (I’d shot up all the 55-grain .223 I had), which gives you all the components: case, powder charge and bullet weight. Average weight was 179.2 grains, with a 1.0-grain spread from light to heavy and a minuscule 0.41 standard deviation. That’s for all you techies out there. But what about price? Hornady is offering Frontier in boxes of 20, 150, 500 and 1,000 rounds. The respective per round costs on Brownells (calculated on non-sale prices) for the 55-grain .223 full metal jacket are 42 cents, 40 cents, 46 cents and 40 cents. For the 5.56 (same site, non-sale) the respective per-round costs are 45 cents, 43 cents, 43 cents and 39 cents. I compared these to Winchester’s USA white box, which offers 20- and 1,000-round boxes. For the .223 full metal jacket, Winchester’s per-round cost is 40 cents for the 20-round box and 38 cents for the 1,000 box. The 5.56 prices on USA white box are 45 cents and 43 cents respectively. I could spend a bunch more of your time and mine doing additional cost comparisons with different brands and different websites, but you get the picture. Hornady’s new Frontier line is as ecomical as other comparable loads, and the consistency evident in its manufacturing should make it accurate in most rifles, so it’s worth your while to give it a try.